As it gets warmer I’m less inclined to want a bowl of warm oats for breakfast – except for those dreary rainy spring mornings which we seemed to have a lot of last week. During the week it’s hard to wake up early enough to make a healthy breakfast, or even to make a quick green smoothie before leaving for work (maybe I need to set the alarm a little earlier.. or stop hitting the ‘snooze’ button). Over spring break It was nice to be able to wake up every morning with enough time to make a healthy, hearty and filling breakfast like Wheat-Free Dairy-Free Sugar-Free Waffles, Spring Eggs and Hash , Wheat-Free Crepes, or Lemon Blueberry Scones. Breakfast and Dinner are the two main meals I usually make, whereas lunch is leftovers or a salad or even a smoothie if I can. Nothing special. I shared a recipe for Overnight Oats in a Jar on Vancity Buzz a little while ago and thought I’d make another. This time I used Almond milk, rolled oats and chia seeds topped with warmed raspberries and a spoonful of almond butter. It’s the perfect combination of warm/cold for those spring mornings. The chia seeds and rolled oats keep you full all morning long. Did you know that the Chia Seeds absorb the liquid from the almond milk, and even expand in your stomach to keep you full longer? Talk about a superfood. They’re packed with protein too. 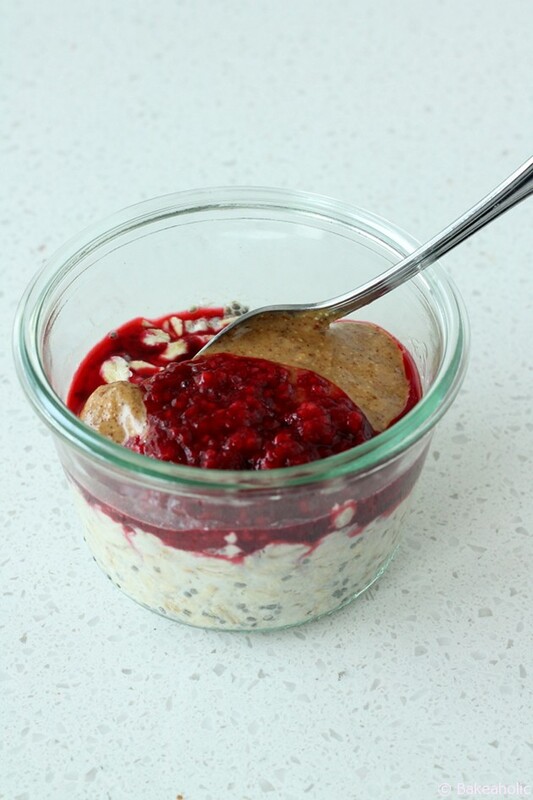 Ever since I found (and bought) Weck Jars from Crate&Barrel I had been wanting to make something in them – and they work perfectly for Overnight Oats. I love the size of the jars, and the lids are awesome. Make breakfast the night before for a healthy and quick breakfast in the morning with overnight oats with lots of different topping options. 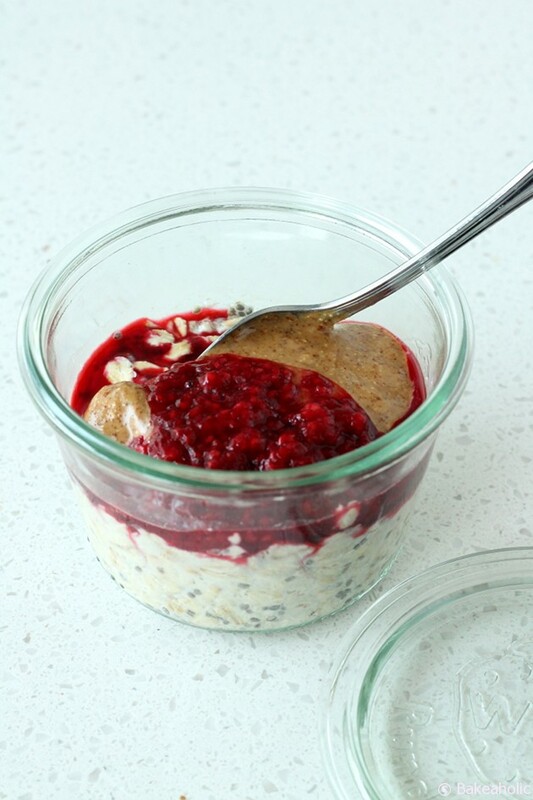 In a jar (best to use) or tupperware add the 1/2 cup of rolled oats and sprinkle with chia seeds. Pour enough Almond milk over top to cover the oats. Place in fridge overnight to set - the chia seeds will absorb the liquid and create a gel-like substance, almost like a yogurt. In the morning remove from fridge and top with berries (I microwaved frozen raspberries) and a spoonful of nut butter. Sprinkle with additional toppings if you desire. Enjoy!